Skaná, the Spa at Turning Stone. 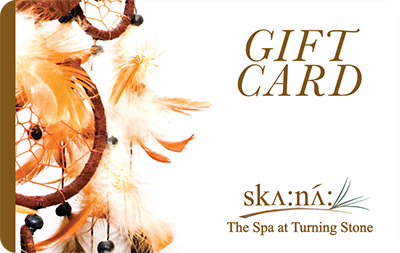 Skaná follows Oneida traditions with a host of services featuring fresh herbs (such as sweetgrass, cedar and sage) and product lines that use natural ingredients. Treatments focus on the use of herbal and mineral wraps, warm salt stone therapy, and relaxing soaks to restore balance and harmony to the body, mind and spirit. Spa features include 12 treatment rooms, a full-service salon, co-ed mineral pool, soaking tubs, steam room, sauna, a luxurious VIP suite with plush amenities including a couple's treatment room and Boutique. The Skaná Spa Café offers nutritious, delicious spa cuisine for lunch. Please Note: Due to the bulky packaging of the Skana Gift Cards, we recommend the Priority Mail option. You may also order gift cards by phone and have them mailed directly to you. Call 315.361.7469. Gift cards usually take 5-7 business days to arrive in the mail.